Yes, I work in a cubicle. It’s a far cry better than sitting at an open reception desk, answering phones and greeting people. And it isn’t quite as nice as a private office. The artist was Edward Robert Hughes (1851-1914). 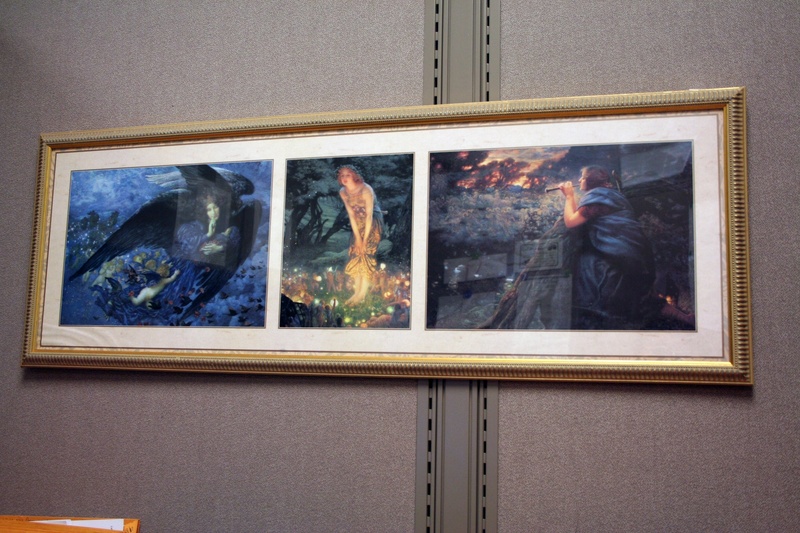 From left to right: “Night with her Trail of Stars and Her Great Gift of Sleep”, “Mid-summer’s Eve”, and “Twillight Fantasies”. “Night” was painted in 1912. “Mid-summer’s Eve” was painted in 1908 and “Twillight” was done in 1911, all toward the end of Hughes’ life. I look at that frame and think, “Fifty cents. Some poor dolt sold that for fifty cents.” I just can’t imagine what they were thinking.